Enlarged speed range: 50-5200 ft/min to cut all materials. Infinitely variable speed. 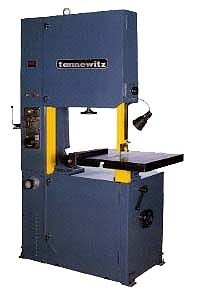 Blade welder, grinder and shear are front mounted for quick, accurate blade repair and installation. Maintenance-free air pump provides air to remove chips from the point of cut. Digital blade speed indicator. Blade tension indicator. Totally enclosed transmission. TEFC 3 Phase motor. Rip fence. Heavy duty cast iron table. Magnetic, low voltage controls. Brush for cleaning lower drive wheel.